Viking Books for Young Readers, 9780451474964, 40pp. A dazzlingly beautiful book about shyness from the author of Blue Chicken, The Story of Fish and Snail, and By Mouse and Frog! Shy loves birds. He'd love to watch them fly and hear them sing, but he's only ever read about them in books. . .until a real bird comes along. He's dying to meet her, but there's just one problem: Shy is, well, shy--so shy, in fact, that he's afraid to leave the gutter of the book. Can Shy overcome his fears and venture out onto the page? 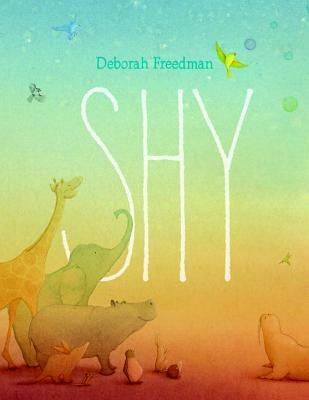 This sweetly relatable picture book from the acclaimed Deborah Freedman speaks to every child who's ever felt like hiding instead of facing the daunting world. Deborah Freedman was shy as a child. Now she is the sometimes shy, sometimes brave author of several picture books for children, including By Mouse and Frog, The Story of Fish and Snail, Blue Chicken, and Scribble. She lives in a quiet house in Connecticut, where she happily read and draws and listens to birds sing. You can learn more about Deborah at deborahfreedman.net.